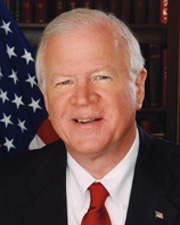 A Senator and a Representative from Georgia; born in Warrenton, Warren County, N.C., November 10, 1943; graduated C.E. Byrd High School, Shreveport, La. ; B.A., University of Georgia, Athens 1966; J.D., University of Tennessee College of Law 1968; attorney, Moultrie, Ga.; elected as a Republican to the House of Representatives for the One Hundred Fourth and the three succeeding Congresses (January 3, 1995-January 3, 2003); not a candidate for reelection in 2002, but was elected as a Republican to the U.S. Senate in 2002; reelected in 2008 for term ending January 3, 2015; chair, Committee on Agriculture, Nutrition, and Forestry (One Hundred Ninth Congress).